Special KLIA Ekspres Ticket Price on Easybook! Looking for the best travel solution after a long and tiring flight journey? Just get onboard the high-speed KLIA Ekspress train that operates between KLIA/KLIA2 and KL Sentral. Arriving right on schedule, this efficient train service covers a distance of around 60 km in nearly 30 minutes with just 15 minutes interval. Travellers coming in from either flight terminal can save a lot of time by opting for KLIA Ekspres. If you are in Kuala Lumpur for a day trip or a business meeting, you can plan your meetings around KL Sentral by taking the KLIA Ekspres conveniently. This is an ideal airport transfer to avoid the unpredictable traffic in Kuala Lumpur. 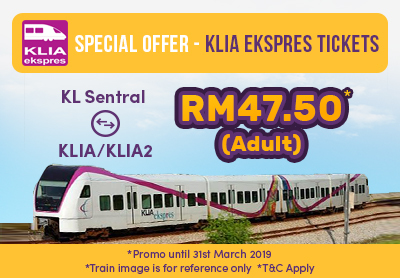 Ticket prices are fared at RM55, but Easybook is offering a special price of RM47.50 for adult ticket with KLIA Ekspres. This promotion is only valid until 31st March 2019. Don’t miss out!